Q: In his speech at a forum in Singapore organized by the British International Institute for Strategic Studies, Australian Defense Minister Christopher Pyne said that there is no gain in stifling China's growth and prosperity and Australia is not interested in containing China. What is your comment? A: We have noted relevant reports. It serves the common interests of the two countries and two peoples to ensure the sound and steady development of China-Australia relations. We hope that Australia and China could work together to move forward the China-Australia Comprehensive Strategic Partnership based on mutual respect and equality. Q: The charges unveiled by the US against Huawei contain detailed evidence, including evidence from emails, interviews and electronic devices. Is it China's position that the whole case is fabricated? A: This morning, I made a response to the US DOJ's indictments of Huawei and Meng Wanzhou. You may have noted that Huawei has also given its response. I would like to reiterate that the Chinese government has all along maintained that Chinese companies should comply with relevant laws and regulations while conducting international economic cooperation. 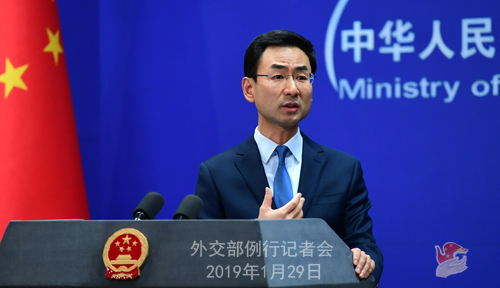 At the same time, China asks that all countries provide a fair, just and non-discriminatory environment for the normal operations of Chinese companies. For some time, the US has been using national power to tarnish the image of and crack down on specific Chinese companies in an attempt to strangle their lawful and legitimate operations. Behind such moves are deep political intentions and manipulations. We strongly urge the US to stop its unreasonable bashing on Chinese companies including Huawei and treat them objectively and fairly. China will also continue to uphold the lawful and legitimate rights and interests of Chinese companies. Q: The US announced its decision to impose sanctions on Venezuela's state oil company. What is your comment on it? Do you think it will negatively impact China's cooperation in the energy sector with Venezuela? Does the Foreign Ministry have the specific number of Chinese citizens in Venezuela? A: China is committed to the principle of non-interference in other countries' internal affairs. We believe that Venezuela's affairs must and can only be determined by its own people, and we oppose unilateral sanctions. History has taught us that external interference or sanctions, instead of helping solve problems, can only complicate matters. The relevant country, by imposing sanctions on Venezuela, will adversely impact local people's wellbeing and should be held accountable for all the ensuing serious consequences. As for the bilateral cooperation between China and Venezuela you mentioned, China is an important partner in economic and trade cooperation for Venezuela. Years of cooperation between the two countries have brought tangible benefits to the two peoples. Following the principle of equality, mutual benefit and win-win cooperation for common development, China will continue to advance across-the-board cooperation with Venezuela to deliver more benefits to the people in both countries. As for the question on Chinese citizens in Venezuela, I can assure you that the Chinese government always attaches great importance to the safety and legitimate rights and interests of Chinese citizens and institutions overseas. 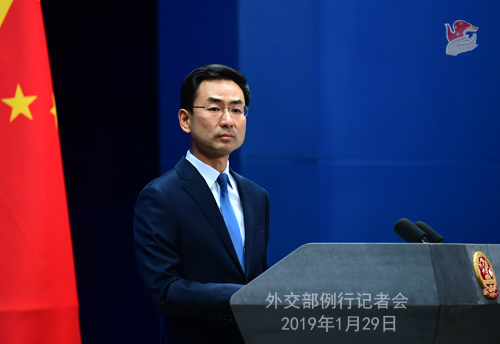 The Ministry of Foreign Affairs and our diplomatic missions have been closely following the security situation in the relevant country and have reminded Chinese citizens there through various means to take necessary precautions. Q: With regard to the US indictment of Huawei, do you expect the announcement will impact, or damage trade talks scheduled for this week in Washington at all? A: As I recall, my colleagues have recently answered similar questions. 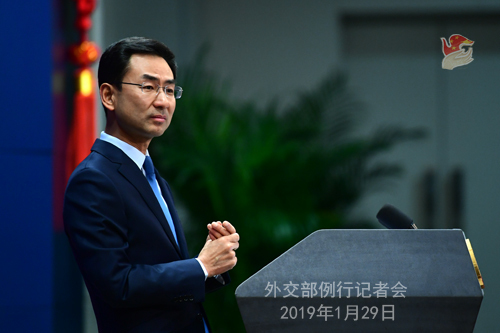 China has repeated its explicit positions on the Meng Wanzhou case and Huawei-related issues so many times that I believe the US must be well aware of them. As for China-US trade talks, we have also made clear our position on it on many occasions. The US knows it very well too. Q: We noted that today, the website of the Foreign Ministry released information on the visit of Emir Tamim of the State of Qatar. Could you tell us who he will meet with while in China? What will be discussed? What is China's expectation for his visit? A: At the invitation of President Xi Jinping, Emir Tamim of the State of Qatar will pay a state visit to China from January 30 to 31. President Xi Jinping will hold talks with Emir Tamim. Premier Li Keqiang and Chairman of the NPC Standing Committee Li Zhanshu will meet with him respectively. Leaders on the two sides will exchange views on bilateral relations and issues of common interest. In recent years, China-Qatar relations have been developing with a sound momentum. Adhering to the principle of equality and mutual respect, the two countries have established a strategic partnership, achieved fruitful cooperation outcomes in the fields of energy, infrastructure building, finance and investment, and realized close cultural exchanges and frequent people-to-people interactions. Emir Tamim's upcoming state visit to China is a second one after a four-year interval. China hopes that through this important visit, China and Qatar will further consolidate traditional friendship, strengthen political mutual trust, deepen bilateral cooperation in various fields within the framework of the Belt and Road Initiative, and move forward the China-Qatar Strategic Partnership. 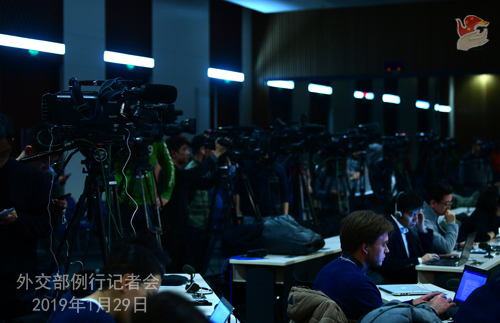 Q: It has been the position of the Chinese government that the case against Huawei and Meng Wanzhou is political in nature. But the US believed that it has a reasonably detailed legal case against Huawei and Meng Wanzhou. So, is it still the position of the Chinese government that this is a political case? And if so, why? A: As I said earlier, for some time, the US has been using national power to tarnish the image of and crack down on specific Chinese companies in an attempt to strangle their lawful and legitimate operations. Behind such moves are deep political intentions and manipulations. This is our position and we have explained it clear enough. I suggest you check out the response made by Huawei this morning in which it has denied all the allegations made by the US against it. 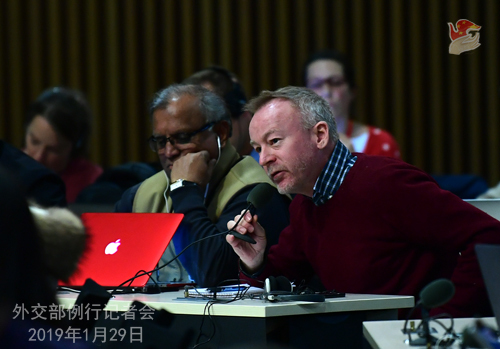 Q: There are reports that the US has now formally asked Canada to extradite Meng Wanzhou. What's your response? A: As for the US indictments of Huawei and Meng Wanzhou, I have given a response this morning. 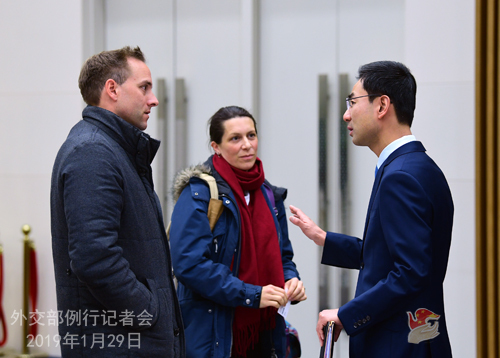 As for the US formal request to Canada to extradite Meng Wanzhou, the Chinese side has lodged stern representations with the US side and the Canadian side separately at the earliest time possible. We deplore and firmly oppose the US side obstinately sending Canada an extradition request in disregard of China's stern representations. We once again urge the US side to immediately drop its arrest warrant and formal extradition request for Ms. Meng Wanzhou. We also urge the Canadian side to take China's solemn position seriously, immediately release Ms. Meng Wanzhou and ensure her lawful and legitimate rights and interests, and stop pulling the chestnuts out of the fire for the US. Q: Sources say that Malaysia's East Coast Railway Link Project, a cooperation project between China and Malaysia under the Belt and Road Initiative, has been canceled. Can you confirm that there is an absolute cancellation or whether it is just temporarily shelved? If so, how might that affect China-Malaysia relations? A: I responded to this question yesterday. I can repeat my answer for you. I have seen relevant reports, but at the moment I am not aware of the specifics. As far as I know, this project was agreed upon by the enterprises on the two sides in accordance with market principles based on equality, mutual benefit and consensus-building. The Chinese and Malaysian sides have been in communication on the relevant matters. Q: The Chinese trade delegation has just arrived in Washington. I wonder if the delegation will discuss the Meng Wanzhou case with the US side? A: The Chinese side has released information on the China-US trade talks. We hope that the two teams will follow the important consensus reached between our two presidents and work in the same direction for a mutually-acceptable solution. This is also the shared expectation of the international community. Q: The Foreign Correspondents' Club of China published results from a survey of its members today about reporting conditions in China. The report said that the survey showed a significant deterioration in the working environment for foreign journalists here. What is your comment on that report? A: The organization you mentioned produces a report of this nature every year. Nothing in it is new, but the same old tune being played again and again. I do not think that the report represents the view of all foreign correspondents stationed in China and it is not worth refuting at all. What I want to point out is that, China will continue, as always, to provide necessary support and assistance to foreign correspondents stationed in China with their normal reporting work. Should you encounter any difficulties in your job or any problems, don't hesitate to come to us. We will do our utmost to help. Such an approach, I believe, is far more constructive than compiling the so-called report every year to level unwarranted criticism against China. It is also more conducive to solving problems. Q: On Venezuela, has the Chinese side been in contact with Maduro or the opposition leader? Which of those two do you recognize as the President of Venezuela? A: My colleague has answered this question last week. Special Envoy of President Xi Jinping attended the inauguration ceremony of President Maduro on January 10, if I recall it correctly. Follow-up: China still sees Maduro as the President of the country? A: I just told you that Special Envoy of President Xi Jinping attended the inauguration ceremony of President Maduro. I believed I have answered you question. What do you find difficult to understand? Follow-up: No, not really. I understand what you are saying, but you have not directly answered the question of who currently you view as the President of the country? A: I have made myself clear. Special Envoy of President Xi Jinping attended the inauguration ceremony of President Maduro. If China does not recognize him, why did we send a Special Envoy to attend his inauguration ceremony? I don't think this logic is beyond your understanding. Follow-up: Have there been any changes since the inauguration of Maduro? A: Do you think I would have answered you in that way if there were any changes? Follow-up: In terms of oil purchase from Venezuela, will China be able to benefit from any sanctions placed by other countries on Venezuela? Will it be able to benefit and get lower prices on oil, for example? A: This is a technical question. I would refer you to the competent authority. What I can tell you is that China-Venezuela cooperation over the years has brought tangible benefits to the two peoples. China will continue to move forward its exchanges and cooperation in various fields with Venezuela under the principle of equality, mutual benefit and win-win cooperation for common development so as to better serve the wellbeing of the two peoples. Q: I have two questions. First, at Duke University there has been a recent issue where a university administrator said that Chinese students should not speak Chinese amongst themselves. I just wonder if the Foreign Ministry has any comments on that? Second, regarding the FCCC report, it documents unfortunate incidents of physical conflict with foreign reporters trying to do their job in China. But Chinese reporters operating in America or Europe don't encounter the same problem. So, what is the position of the Foreign Ministry on this? Is the Foreign Ministry going to be a supporter of the foreign media in doing their jobs or are you just going to pass it off as chaotic situations? A: I would take your second question first. Like what I just said, we will provide support and convenience to the normal reporting work of the foreign correspondents in China as always. You can come to us if you have encountered any problem or difficulty in this process, and we will try to do everything possible within our capacity to resolve it. I believe such constructive interactions will be conducive to building mutual trust between our two sides and to settling problems. This will prove to be far more constructive than publishing an aggressive report, and more helpful to your work here in China. As for your first question, to be honest, I don't think what you asked about is a diplomatic question. But I am so tempted to ask you that if a Chinese university forbade its American students from talking in English, how would they think? I don't believe this makes sense in any way. Q: An EU delegation visited Xinjiang in January under the supervision of Chinese officials. What are your comments on this? A: As far as I know, some officials from the European Union did visit Xinjiang recently. This visit is believed to have helped them better understand the situation in Xinjiang in an objective way, especially the preventive counter-terrorism and de-radicalization actions taken by the Xinjiang Uyghur Autonomous Region. Under the current complex international circumstances, China and the European Union should continue to strengthen strategic communication and coordination, respect each other's core interests, leverage the China-EU cooperation to uphold multilateralism, and jointly promote world peace, stability and development.